The news, thoughts, designs, dreams, and confessions of Carin Huber, craft designer and writer. I may Bee crazy, but I'm finally following through on a desire I've had for several years to keep bees. Far be it from me to do anything in the standard way. 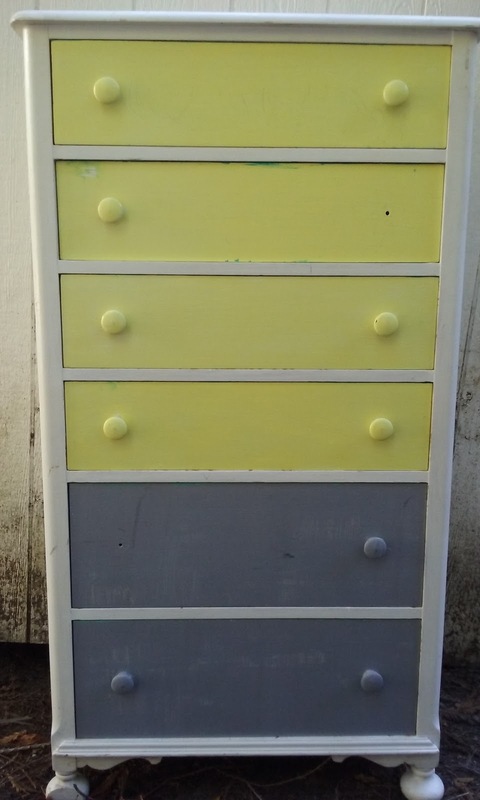 Rather than building or buying a traditional hive box, I recently acquired a sturdy but somewhat beaten-up highboy dresser to convert into a hive. With its all-solid-wood construction, a thorough coat of exterior house paint, and some ingenuity, I expect it to hold up for quite some time. I've started the new paint job. It may not look like much of a change from the old colors yet, and in fact the old colors influenced the new ones. But it will be a distinctive design, with varying shades of dusty lavender and pollen yellow set off by crisp white. will lay eggs, and the workers will raise brood and store pollen and honey to feed the hive. Each hive drawer will have two or three entrance holes drilled through the front. Unused drawers will have corks in the entrances to keep them from being colonized all willy-nilly, but once the nuc drawer is pretty well established I'll connect it to the drawer above by means of a length of tubing run between a hole on the nuc and a hole on the new drawer. This will give the bees access to more space without allowing them to build in the body of the dresser. If they need still more room before I start collecting honey comb for my own use, I'll add a tube from that drawer to the next one up, and so on, as high as the second drawer from the top. The bottom drawer will be storage. The top drawer will be altered to provide access to the top of the drawer below it for maintenance and feeding, if necessary, while keeping that drawer closed. You may have noticed the dresser is missing a couple of knobs. 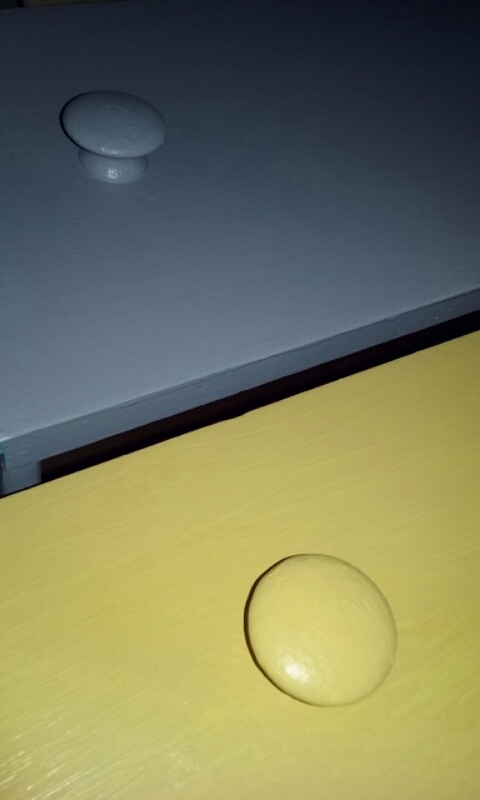 I've moved the odd yellow knob down to keep the odd grey knob company. They will soon both be lavender. 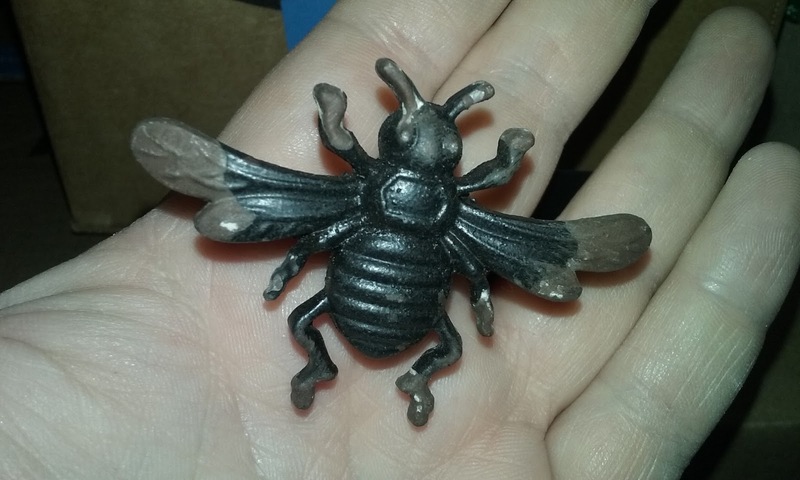 In their place on the second drawer down will be cast metal bee knobs, already looking aged and worn to perfection. The finishing touch will be art work, like the bees at the top of this post, courtesy of Karen at The Graphics Fairy. She combs estate sales and antique stores to source print art that has fallen into the public domain. Many of these pieces she shares as free printables on her blog, along with instructions for beautiful crafts you can make with them. She also gathers images into theme packages you can access via a monthly subscription. If you just think you might want some piece of vintage art for a project, you must visit The Graphics Fairy! Time for a cup of tea. Where did that jar of honey get to? I haven't been very crafty the last couple of years. Life got sad and I got otherwise occupied dealing with it. But I don't want to drag down this poor, neglected blog with the details when I feel the creative juices starting to flow again! While I may not have produced much art recently, I have been thinking about it, and some of those thoughts are finally starting to take shape in the real world. There is a highboy dresser in my backyard waiting to become something the manufacturer probably never dreamed of. There is a stack of styrofoam insulation leaning against my empty aquarium. And I still have plans to cut holes in the end of my storage shed. What the hell am I up to with these things? Stay tuned. And there's more, an even grander project in the works. It's a project so big I've enlisted the help of friends and colleagues across the United States to help me make it a reality. But that's all I have to say about that right now. Grandma (“Mother” to my dad and his siblings) has become a bit difficult to gift for. She has been working for a few years on disposing of some of the piles of stuff she had taken to hoarding over the last twenty years. While the project is slow-going she is serious about it and about not wanting more stuff that she doesn’t really need coming into her house, so any gifts for her need to be of the use-it-up or wear-it-out variety. I didn’t want to just give her a gift card, but I only had a couple of days to produce a gift for her. What to do? This is a simple single-crochet pattern that makes up in just a few hours. 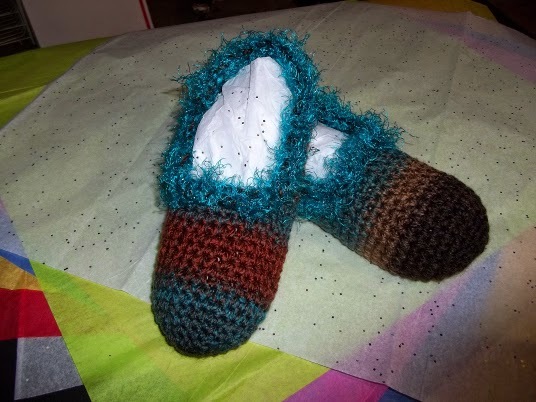 Each slipper is worked in one piece with just a short seam at the back of the heel. Rounds are not joined; the toe boxes are crocheted in a spiral. In my last blog post I talked about how much I hate trying to work that first row of crochet into the starting chain, and contemplated starting with a knitting cast on in place of that traditional crocheted chain. I haven't gotten around to trying that just yet, because I discovered the Foundation Crochet in single, half double, and double heights. I stumbled across them completely by accident while perusing patterns on Ravelry. Labels: crochet, tutorial, why didn't I think of that? I've been working on three different knitting projects lately, which I'm loving, but I'm also starting to get the itch to do something different. This happens to me all the time. I'll get hooked on a particular craft, go at it like mad for a while, then get bored and want to do something else. Eventually I circle back to the first craft; it goes in cycles. So, I'm nearly done with my Slither gloves, and I'm already wanting to plan another project, but I'm thinking crochet, which I've been doing far longer than I've been knitting. I started surfing the patterns available through Ravelry, and Oh My Gods, so many beautiful patterns, and so many of them available for free! There are some crocheted shawls and stoles I would love to try, but they look like the beginning chains are sooooo long! The hardest, most frustrating part of any crochet project for me is working that first row into the stitches of the starting chain. I crochet with a really tight tension, so much so that I usually have to go up at least two hook sizes to match gauge on someone else's pattern. This means that while my work may come out the right size, I still have a hard time working the hook into those tight chain stitches. If I make the chain with a larger hook, this might give me the room to move that I need to not go crazy, though I would need to make sure doing that wouldn't adversely affect the project. 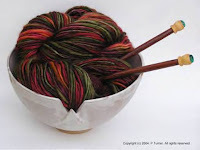 But what if, instead of crocheting a starting chain, I cast on the required number of stitches as for knitting, using a long-tail cast-on on a convertible circular needle? If I use a needle size to match the hook size, I'll end up with perfect little loops that stand up free from the bulk of the cast-on, resting loosely along a thin cable. If I take one needle off after casting, insert the hook in the first stitch, pull up a loop from the working yarn and start crocheting into each stitch while it still sits on the cable, the cable should slip out easily enough once the first row is done. Image borrowed from Patricia at Knitting for the Soul. New knitters and crocheters usually start with projects that are small, flat, and rectangular, like dishcloths and winter scarves. Usually these projects completely ignore the issue of gauge, as it just doesn't matter. You knit or crochet until it's the size you want, and you're done. And that's fine, as long as you never want to make anything else. 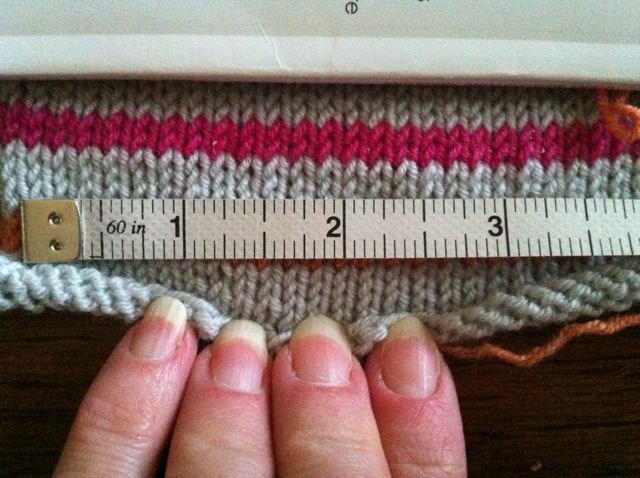 Yarnologue posted an excellent explanation of knitting gauge, why it matters, and how to adjust to get the correct gauge. This information applies to crochet as well. There, now that you understand gauge, go forth and drown your parents in socks, gloves, and hats. Heap piles of plushies upon your nieces and nephews. Stop your sister's shivering with shawls. Just don't knit a sweater for your boyfriend. Just a quick link post this month, to an article I wrote some time ago for the AntiCraft. It's just a simple why-to/how-to about preparing your fabric for sewing, before it ever sees the cutting table. One of my hobbies is collecting hobbies. If a craft can be done with a minimal initial cash outlay, and will give results in no more than a few days, I'll try it, and usually get hooked.